After the introduction of beads, people stopped using quills for a while because the beads were more sturdy, and they were more durable, I guess, than quills. But now I see the art is coming back. These summer mittens made of tanned caribou skin are from the Ahtna people of the Copper River valley. They would have been worn with a caribou hide tunic, hood, and moccasin-pants. 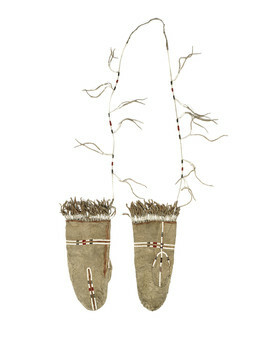 The mitts are simply but beautifully decorated with bands of dyed porcupine quill stitching and with quill-wrapped fringes, and have a quilled keeper-string that went around the neck. The mittens were collected in the 1870s, a time when glass trade beads were replacing porcupine quill designs on Athabascan clothing.